From left, second-year medical students Zaid Mohsen, Harshita Pinnamaneni and Inara Ismailova, also pictured in the additional photos, are members of the Auntie Na's student organization, and part of the group remodeling the home behind them that will house a health care clinic and other resources for community members like the two children on the porch. 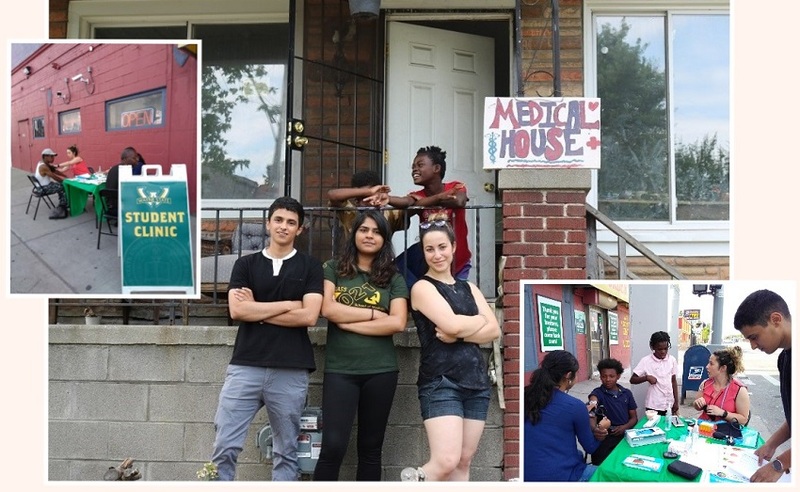 Board by board, house by house, a village made by and for the people it will serve is being born on Detroit's west side, and the Wayne State University School of Medicine is an integral part of the development. Yellowstone Street, at Elmhurst Avenue on Detroit's west side, is the site of Auntie Na's House, a nonprofit 501(c)3 organization that will soon include a new student-run health clinic aimed at women's health and wellness. The clinic will be located on the first floor of a home across the street from the original site now being renovated by members of the School of Medicine's Auntie Na student organization. The rehabilitation of the two-story home is made possible by a $150,000 grant from the Kresge Foundation, and supported by the leadership and expertise of Associate Professor of Medicine and Director of Subinternship and Ambulatory Programs Joel Appel, D.O., who will serve as the clinic preceptor, and School of Medicine Director of Co-Curricular Programs and Assistant Professor of Internal Medicine Jennifer Mendez, Ph.D. The students are looking for faculty, specifically obstetricians and gynecologists, to volunteer at the clinic, and eventually, a steady pool of patients for students to assist in caring for, and learning from. "If we can make this a focused clinic, more women-centered, students will want to come, because they will want to work on those specific skills," said second-year medical student Inara Ismailova. The Medical House, as it is known, is already the site of tutoring on the second floor, and art projects by children who participate in Auntie Na's regular community enrichment programming, including summer camps, monthly street bazaar fundraisers and more. A medicinal garden of Echinacea and other herbs and flowers was planted by School of Medicine students on the home's front lawn earlier this year. Students from Ohio's Oberlin College are collaborating with WSU School of Medicine students on a variety of programming, and the students help each other on several projects. The Medical House is expected to be completed in a year, and will be considered part of "Auntie Na's Village" -- houses being remodeled or rebuilt this year on the same street as Auntie Na's, a colorful two-story home that has been in one family for six generations. The village will include a nutrition house, a clothing house and other buildings aiming to care for the community at large, especially children. Some homes will be built from the ground up in vacant lots adjacent to the original home; others will be located in now-abandoned homes across the street. The Auntie Na's Student Organization at the School of Medicine is new, officially forming earlier this year after second-year students who volunteered at Auntie Na's House in the 2017-2018 academic year for their Year 1 required service-learning project wanted to keep going, and do more. The organization has an executive board and about a dozen active members, over three branches of outreach -- youth enrichment, gardening and nutrition, and clinical care, with two student coordinators at each branch. They're already working with fellow medical school student organizations on programming at the house. They're the same group that, using a $2,000 grant from Gleaners Community Food Bank and Campbell Soup Co., host "Heart Smarts" events every Tuesday and Thursday from 5 to 6 p.m. on the sidewalk in front of E&N Market on Livernois Avenue in Detroit. There, the students perform health screenings, including blood pressure, then discuss the individual's diet and present them with a healthy eating plan. From there, another student shops with them inside the corner store, recommending better food options, reviewing sodium and sugar content on nutritional labels, and providing $6 to use for fresh vegetables, fruit, water, milk or eggs. Dr. Mendez brought the program idea to the students. At the request of the School of Medicine, the store stocks more produce than it had, and recently installed an additional refrigerator to hold healthy items for customers to purchase. "They've started stocking healthier food options here," said second-year medical student Zaid Mohsen.